Kids Cruise Free Days: As part of our Spring Loaded Promotion, kids ages 11 and younger can cruise for free with a purchase of an adult ticket. Discount available between 3/14/19 - 5/14/19. Please call to book, 1.800.238.2463. Considered one of South Lake Tahoe’s most entertaining and affordable water activities, the Daytime Scenic Cruise on Lake Tahoe has been voted “Best Cruise in Nevada” by Nevada Magazine. This 2.5-hour scenic daytime cruise offers fabulous photo opportunities, sunshine, and fresh Lake Tahoe air, which has a way of invigorating everyone around. As you cruise to Emerald Bay, you'll learn how it was formed, some of its fascinating history, and enjoy a special video presentation. With plenty of room to spread out and get comfortable, you’ll quickly settle in and find the best place on-deck to snap magazine-worthy photos. Professional photos (taken upon boarding) will be available for purchase at the end of the cruise. For our passengers' comfort, smoking is not permitted aboard our boats. Personal picnics are not permitted aboard the M.S.Dixie II. However, lunch and complete bar services are available for purchase once on-board the boat. The M.S. 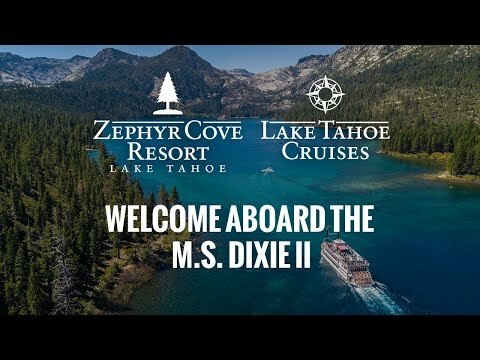 Dixie II departs from historic Zephyr Cove, Nevada, just 4 miles north of Stateline on Hwy. 50. Please check-in 30 minutes prior to departure time to receive boarding passes. Complimentary shuttle transportation is offered from select local Lake Tahoe areas. You will have the opportunity to opt-in for this shuttle service during the online booking process. Learn more about our paddle wheeler. We provide complimentary Shuttle pick-up and drop-off service, however the service is first-come, first-served. There is a nominal transportation fee for groups of 20 or more. If space is not available, guests will have to find their own way to Zephyr Cove Resort (for M.S. Dixie II). Parking is $10.00. Parking at Zephyr Cove Resort is $10.00 per car, and spots are limited during the summer season. We encourage you to utilize our complimentary shuttle service if possible. Please cancel at least 24 hours prior to departure time in order to avoid a no show or cancellation fee of full payment. Please check-in at the M.S. Dixie II Ticket Booth at least 30 to 45 minutes before departure time to pick up boarding passes. Full payment plus tax is due at time of booking. Only service animals are allowed on the boat. Due to increased National Security Levels, we reserve the right to search guests and their personal belongings prior to boarding the boat. No smoking is allowed inside the M.S. Dixie II; Smoking is prohibited on the 3rd deck and outside viewing areas. Save up to 15% on advance booking!